Note: My Web pages are best viewed with style sheets enabled. Before looking at any proposals for reform, we must first be clear about what happened at Enron. The largest bankruptcy in the history of the United States occurred when rumors (which proved true) began circulating about the precarious state of Enron's finances. Because of news that became worse and worse, investors and banks alike refused to buy Enron's debt. A proposed merger with Dynegy (which might have rescued Enron) was cancelled when the revelations scared Dynegy away. The major contributor to Enron's financial difficulties was its use of limited partnerships, many created in small Caribbean nations that have minimal regulation of business structures. These partnerships were intended to finance Enron's overly ambitious expansion while minimizing public disclosure and the company's liability. However, Enron executives who were in charge of these partnerships treated them as their own private treasure chests. While the partnerships lost millions of dollars, the executives made millions of dollars from their participation. Further, public disclosure could be avoided only if outside interests owned substantial shares of the partnerships. Much of that outside ownership, however, was contrived and might even have been criminally fraudulent. As the rumors circulated ever wider, Enron executives quietly sold their Enron stock before it collapsed. At the same time, they imposed a freeze on employee transactions involving Enron stock in their 401(k) (retirement savings) accounts. From Congressional testimony by some Enron executives, it now appears that the management knew the company was a house of cards ready to collapse when they were still exhorting employees to buy more stock for their retirement. Not only did thousands of employees lose their jobs when Enron declared bankruptcy, but also thousands found their dreams of retirement turn into nightmares. Many at retirement age will be unable to afford to stop working. Two days before declaring bankruptcy, Enron declared and paid $55,000,000 in bonuses to 550 key executives and managers. The usual practice among corporations is to declare bonuses along with performance goals for those individuals receiving them. The bonuses are paid only after those goals are reached. However, in this case, bonuses declared before bankruptcy but not yet paid would have been nullified by the court. Thus, Enron rewarded its officers without waiting for any real indication that the bonuses were deserved. In the meantime, severance pay to employees at the bottom of the organization chart who were fired after the declaration of bankruptcy has been paltry. Independent audits of the financial statements and condition of publicly traded corporations are supposed to keep executives honest and provide an early warning to investors when there is an attempt to hide bad news. Anderson (formerly Arthur Anderson) — Enron's outside auditor — apparently conspired with the company's executives to create this disaster. That is the only conclusion I can draw from Anderson's massive shredding of Enron's documents, destruction that continued after it was known that both Congressional and criminal investigations had started. Federal prosecutors draw the same conclusion and have obtained a criminal indictment against Anderson (the entire firm) for obstruction of justice. Since federal laws prohibit a convicted felon from certifying the audit of a publicly held corporation, this could mean the end of Anderson. Calls for reforms in corporate governance, the administration of 401(k) plans, and other company practices grew louder after the collapse of Enron. However, we must recognize that these demands are not a "knee-jerk" reaction to a single event. Corporate mismanagement existed before Enron and will continue unless reforms are implemented. Originally, the board of directors of a corporation was intended to represent the stockholders — the owners of the company — and represent their interests. The board ensured that the company operated in the best interests of those owners, not only protecting their investment but also making that investment grow in value. Although the corporate form of business was developed several centuries ago, the role of the board of directors as the owners' representative is not obsolete. Even today, the courts hold directors liable when they shirk their responsibilities to the stockholders and place their own interests first. But the most important task for a board of directors is supervising the executives in charge of the day-to-day operations of the company: most definitely the chief executive officer (CEO), usually the president or chief operating officer (COO), and sometimes the executive vice-presidents. The board hires and promotes these executives. It evaluates them to determine their salaries, bonuses, and other compensation. If necessary, the board disciplines and even fires executives. This role of the board of directors as employer of the executives is compromised in many corporations by the fact that those same executives are members of the board. In many cases, a majority of the directors are executives — employees of the company. Several years ago, large institutional investors — especially retirement funds for government employees — recognized the strong conflict of interest created by this situation and began to demand more "outside" (non-employee) directors be on the boards. Stockholders are taking back control of the corporations they own. At the 2002 annual meeting for Bank of America, a clear majority of the stockholders voted for a proposal strongly opposed by the bank's management. This proposal denounced the excessive termination bonuses being paid to departing executives (bonuses not available to ordinary workers). At the annual meeting for media and entertainment giant Vivendi, the stockholders defeated a management-sponsored proposal to issue generous stock options to executives. At least one other management-sponsored proposal was also defeated. While many companies have increased the proportion of outside directors, the conflict of interest still remains. In almost every company, the CEO — the employee at the very top of the organization chart — is also the chairman of the board of directors. Sitting at his side at the board meetings (and, yes, the CEO is almost always a man) are the COO and some of the vice-presidents who report to him. The board notwithstanding, these officers owe their jobs to the CEO. How will they vote when there is conflict between the CEO and outside directors? Generally, the CEO was involved in selecting the outside directors. And in companies where only outside directors can be members of a board's compensation committee (which determines executive bonuses and compensation), the chairman of the board — the CEO — often appoints them. Only in extreme situations will a board of directors oppose its own CEO. Rarely will the board exercise its responsibility to the stockholders — owners of the company — and its authority as the employer of the executives by giving the CEO a truly careful and objective evaluation. How does this conflict of interest affect a company and its owners? To protect the well-compensated jobs of their executives, companies adopt by-law provisions to discourage hostile take-overs by other companies, which depresses the value of the company's stock. Those provisions might involve "golden parachutes", special bonuses to executives who might be laid-off after a merger — without any similar protections for the employees whose efforts produce the products or services that the company sells. When profits decline, employees may find their wages frozen for more than a year or even cut, something that does not apply to executive bonuses. Stockholders often see their dividends cut and the value of their shares decline without any corresponding reduction in executive compensation. Aquila, Inc. (another energy company) paid five top executives $30,000,000 in bonuses in February. Far in excess of the company's own standards for bonuses, the payments were justified by the company's rapid growth last year. This vividly illustrates the incentives for executives to issue fraudulent financial reports. One month after awarding the bonuses, 500 employees were laid off in a move intended to save the company $35,000,000. Over 400 jobs could have been saved if the bonuses had not been granted. And how much did the company's owners receive from last year's growth? Actually, the same board of directors that granted the bonuses and laid off employees — a board on which some (or all) of the rewarded executives vote — also cut the dividends paid to the owners. Now we see who Aquila's directors represent. America Online and Xerox illustrate a specific kind of conflict of interest. In May 2000, America Online paid a civil fine of $3,500,000 to the Securities and Exchange Commission (SEC) for issuing false financial reports that inflated its profits. Now, in April 2002, Xerox is paying a civil fine of $10,000,000 to the SEC for the same offense. When a company reports excellent profits, its stock tends to go up. This can benefit top executives in that company because many executives receive bonuses based on how well their employer's stock performs. Yes, inflated stock prices based on false reports of profits do benefit stockholders — until the fraud is exposed and the stock drops. In the long term, however, stockholders benefit more from honest financial reports that allow them to judge the true performance of their executives. In the end, when executives are also members of the board of directors, they often get to keep bonuses based on false reports; they become the only long-term beneficiaries of their own fraud. Reform: Employees of a publicly-held company should be prohibited by law from serving on that company's board of directors. To close the nepotism loophole, this prohibition should extend to close family members (e.g., the CEO's wife, the COO's brother). In recognition of modern relationships where the ties of the heart may be very strong without any ties of marital law, this prohibition should also apply anyone living in the same household as an employee. To prevent a "revolving door" loophole, this prohibition should also apply to anyone who was employed by the corporation during the 12 months prior to being nominated to the board of directors. And anyone who was on the board of directors should be prohibited from being employed by the company during the 12 months after leaving the board. Yet simplistic rules can sometimes operate contrary to their intent. To ensure that the board of directors does indeed represent the stockholders, any employee whose immediate family owns 5% of the voting stock in a company should be allowed to be a director. (The entire board of a large corporation might collectively own only 1% or 2% of the stock. Where I work, the board together owns 2.6%; but over half of that is owned by one person.) Further, when an organization of non-executive employees (e.g., a union) owns 5%, an employee who is a member of that organization should be allowed to be a director. And yes, when the ownership is 10%, two members of an employee's family or two employees in an organization could be directors. This exception recognizes the fact that employees of a company can also be stockholders. Note that this prohibition does not apply to employee-owned companies, which do not fall within the designation publicly-held. Named for the section of the Internal Revenue Code that authorizes such plans, a 401(k) plan provides tax-sheltered investment for retirement for a company's employees. An employee contributes a percentage of his or her pay to the plan. The amount contributed is held in a trust and invested — usually as the employee directs — in any of several options provided by the employer. That money is subtracted from the employee's gross pay before computing the taxable pay on his or her W2 form. Thus, the employee pays no income taxes on that money when it is earned; instead, it is taxed at retirement as the employee withdraws it from the plan. In addition, many companies with 401(k) plans match a percentage of their employees' contributions into these plans, usually in the form of stock in the company; often, there are restrictions against transferring funds from that stock into other investments. A 401(k) plan involves investing in the stock market (and other investments) for retirement. This is also true of Individual Retirement Accounts (IRAs). Thus, President Bush's plan to allow workers to divert some of their Social Security taxes into stocks is not necessary. Worse, it could be dangerous! The collapse of Enron is not unique, but it is rare. More common is a decline in a company's stock because of trends in its industry or a general decline in the stock market as a whole. After all, stocks go down almost as readily as they go up. Yes, there is a role for stocks in retirement planning. However, as Enron employees discovered, there must also be a role for a government guarantee of a specified monthly annuity, for Social Security payments that do not fluctuate with the stock market and that do not depend on the continued solvency of any business. In the meantime, 401(k) plans and IRAs already provide ample means for investing in stocks for retirement. At Enron, executives exhorted employees to put more of their 401(k) money into Enron stock while those same executives were selling their own stock. Then, just as the truth became known about the faked financial reports, the 401(k) plan was frozen so that employees could not dispose of their Enron stock while it still had some value. 401(k) accounts that had been worth over $500,000 were soon worth less than $20,000. However, what happened at Enron was only one example of corporate abuses of 401(k) plans. In numerous cases, companies delay a month or more before depositing their employee's money into their 401(k) accounts. This delay reduces the earnings on the employee's investments and provides the companies with interest-free loans. A company with an ongoing relationship with a bank or stock broker might have that firm operate its 401(k) plan even though more efficient and less costly alternative financial institutions are available. Usually, the plan itself pays for its operating costs though a charge against each employee's account. Thus, at no cost to the company, it can reward a bank or broker for special services. The primary problem is that, while most of the funds in a company's 401(k) plan belong to the employees, the company rigidly controls the operation of the plan. As in the case of Unisys buying Executive Life paper, investment decisions are made without consulting those who own those investment. Indeed, the available choices of investments, the trustee holding the accounts, and the investment manager are all chosen by the company without any input from the employees. This is a more significant problem than how much of a company's stock is in the plan and the ability of employees to transfer their funds from that stock into other investments. Reform: A company's 401(k) plan should be administered by a committee appointed by the participants in the plan. Since this committee would represent the employees in the plan, it would be in a position to deal with such issues as delayed investments of money withheld from employee paychecks. Reform: An employee who is vested in his or her company's matching contribution should be allowed to transfer the funds to any investment option allowed for employee contributions. Despite my criticism of its handling of the Executive Life situation, I must admit that the Unisys 401(k) plan had a good alternative to this reform. Any employee who had reached age 50 and had five years of employment by Unisys could transfer employer matching contributions from company stock to any of the many available other investment options. Further, such employees could also direct future matching contributions into those other options without having to repeatedly request transfers from Unisys stock. However, when Unisys stock collapsed to $2 per share, two things happened. Executives noticed that non-management employees were accumulating stock — at company expense — far cheaper than permitted by any executive stock options. At an annual meeting, for every 7 shares of Unisys stock held by the 401(k) plan, 3 shares had their votes withheld from the re-election of CEO Blumenthal (possibly a protest against a wage and salary freeze that failed to include executive bonuses). The prospect of the non-management employees accumulating control of the company through their 401(k) stock so frightened the executives that they stopped all employer matching contributions to the Unisys plan. They claimed this was a cost-cutting move needed because of a severe down-turn in the company's fortunes. However, no similar cost-cutting move affected executive compensation. Once an employee in a 401(k) plan fully owns the employer's contribution, the employee should have the ability to invest that money as he or she chooses. After vesting, the employer should have no control over whether company stock is sold to invest in a growth mutual fund or certificates of deposit, just as long as the money remains within the 401(k) plan. Yes, I see employers changing their vesting rules if this reform were adopted. Some might impose vesting where today they have no vesting period at all. An employer enjoys having a substantial pool of company stock locked up in a 401(k) plan where no other company can grab it to start a hostile takeover. 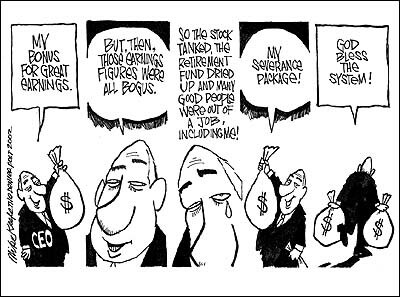 But this reform is necessary to recognize who really owns the funds in a 401(k) plan. Therefore, it should also include limits on vesting periods. For vesting in both past and future employer contributions, the limit should be five years. For sliding vesting in past contributions, the limit should be two years with all contributions vesting when an employee retires. Note that I oppose any reform relating to the amount of employer stock that can be in an employee's account. By allowing employees to shift employer contributions to other investments, employees could reduce the amount of their employer's stock in their accounts to whatever extent they choose. At the same time, by not imposing a limit, employees of well-run, growing companies would not be penalized by being denied participation in that growth. Further, employers would still be able to make their matching contributions in the form of stock rather than impairing their cash-flow by making money contributions directly to other investments. When a publicly-held company hires an outside accounting firm to conduct an independent audit of its financial records, the company is not the only recipient of the certified report. When the company borrows money, the banks and bond buyers want to see the report to assure themselves that the company's credit application is honest. Mutual fund managers and individual investors want to see the report — certified by an accounting firm not under the control of the company — so that they will know that claims of sales and profits are real. Enron was not the only case in which Anderson failed the public by certifying financial reports that hid the true state of a company. In June 2001, Anderson paid civil fine of $7,000,000 to SEC for certifying fraudulent reports that Waste Management used to inflate its performance. (Waste Management executives used those reports to reap fancy performance bonuses, another example of the conflict of interest that occurs when executives sit on the board of directors.) And in March 2002, Anderson reached a civil settlement of $270,000,000 with the Baptist Foundation of America for failing to detect fraud and other financial wrongdoing that led to the bankruptcy of that charity. Other major independent accounting firms have also been caught in recent years in similar violations of the public's trust. Ernst & Young paid civil damages of $335,000,000 in 1999 to stockholders of real estate and travel company Cendant Corporation for ignoring irregularities in that company's financial reports. In the case of Anderson and Enron, however, the penalty may be "corporate capital punishment", the end of Anderson's existence. Why do accounting firms — whose audits are supposed to find or prevent fraud — turn a blind eye to "cooked books"? This is a relatively new situation. While today, accounting firms are fired when they fail to disclose fraud, years ago accounting firms were fired when they insisted on publicizing fraud. The answer is, of course, money. No, Enron did not actually bribe Anderson. However, auditing is actually a low-profit activity. In the 1980s and 1990s, accounting firms discovered the much greater profit in consulting: helping their clients to recruit new executives, change operations to improve cash flow, develop plans to close U.S. factories and open new factories in other nations. Enron contracted for extensive consulting work from Anderson with the implication that, if Anderson did not cooperate, that work would go to other consultants. Cooperate? Greed made Anderson an active and enthusiastic participant in Enron's fraud. And this was no more a unique, isolated incident than was Enron's. Reform: An accounting firm that audits the financial reports of a publicly held corporation should be prohibited from providing any other services to that company. Among other duties, the California State Treasurer is an important member of the boards that govern the Public Employees Retirement System (PERS) and the State Teachers Retirement System (STRS). PERS provides pensions not only for state employees but also for many employees of local government. On the November 2002 California ballot, Republican Greg Conlon opposed incumbent Democrat Philip Angelides and candidates of smaller parties for the office of Treasurer. During his successful primary campaign, Conlon cited his 30 years at Anderson as qualifying him to handle the state's money and oversee the pensions of more than 1,800,000 Californians. He even cited how he rose to become a senior partner within the very same firm that helped to destroy the retirement hopes of thousands of Enron employees. Thanks in part to actions by Anderson, where Conlon had been in a position of leadership, PERS lost $45,000,000 and STRS lost $40,000,000 on their Enron investments. Thus, during the campaign for the November election, Conlon stopped citing his experience at Anderson. That failed to help his election. Conlon received 40.5% of the votes while Angelides received 49.4%. Trying to hold onto its very existence, Anderson now proposes to separate its auditing and consulting services into two distinct organizations. Similar proposals are now circulating throughout the accounting industry. This is both insufficient and unnecessary. At the top, Anderson officers would still know which auditing clients are also consulting clients. Further, some of the same skills and experience used in auditing can be very useful in consulting. The separation proposed by Anderson would inhibit that synergy. My proposed reform would allow the synergy to continue but without the conflict of interest. A negative audit report on a company could not cost an accounting firm any consulting business with that company because such business would be prohibited. To prevent any delayed conflict of interest — in which an accounting firm ignores improper business practices in exchange for future consulting work — an independent accounting firm should be prohibited from providing consulting services to any company for three years after the last time the firm certified an audit report on that company. Three years should be sufficient time for the replacement accounting firm to find if the company's reports are fraudulent. Only when audits are completely separated from other business activities of accounting firms can they be independent audits. Note: Representative John LaFalce (NY, Democrat) had the same idea. He wrote H.R.3818, which would have prohibited independent accounting firms from providing nonaudit services for audit clients. The "business as usual" Republicans in the House Committee on Financial Services defeated this necessary legislation. Reform of the corporate world will have to wait until the voters reform Congress. Reform: The outside auditors should report only to the board of directors, not to the executive employees. For this to be a true reform, of course, executives should not be on the board of directors. While the audience for an audit includes many others, the primary purpose is to assure the owners — the stockholders — that their employees are operating the company in an honest manner. This can happen only if the auditors report directly to the owners' representatives on the board of directors. The close relationships that occur when auditors report to a company's executives should be discouraged. After all, the financial reports that the auditors certify are very often used to determine the bonuses and other compensation of a company's executives. Legislation passed by Congress — which President Bush promises to sign — does nothing to end the conflict of interest caused when corporate executives sit on their employer's board of directors and when the top executive chairs that board. Further, the fund established in that new law to compensate stockholders who have been defrauded by corporate executives will pay millions of dollars to compensate for billions of dollars in losses.